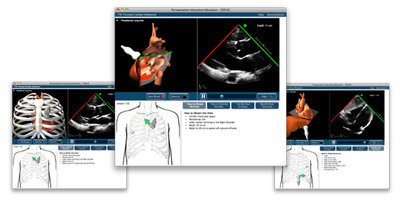 Welcome to the Virtual Transthoracic Echocardiography (TTE) Web site. This site provides teaching resources that can be used by medical educators in the classroom, and by trainees for self-study. Ongoing financial support for the development of this website is gratefully acknowledged from the Peter Munk Cardiac Centre Innovation Fund. The TTE Standard Views and TTE FOCUS Views modules are now available on the iPad. These apps include the same features as the web module. Updating the TTE FOCUS Views app: Users who are updating the TTE FOCUS Views app from the previous version, please delete the app from your iPad and then reinstall the new version from your purchased apps in the App Store. If you simply update the app, there is a problem accessing the normal TTE views. We apologize for the inconvenience, and are working on a solution for this problem. The first module covers the five TTE views used in a Focused Cardiac Ultrasound (FOCUS) assessment of cardiac function that may be performed by anesthesiologists, intensivists or emergency medicine physicians. The second module covers the 20 standard diagnostic TTE views that are used by cardiologists in conducting a full echocardiography exam. These modules provide a 3D model of the heart allowing the user to visualize the relationship between the probe and echo plane and the heart, and relate the cardiac structures in the TTE image to 3D model. As with our Virtual TEE site, future modules will cover alternate TTE views and colour Doppler, as well as examples of cardiac pathology. The Standard Views module has launched. The TTE website has launched with the FOCUS module.